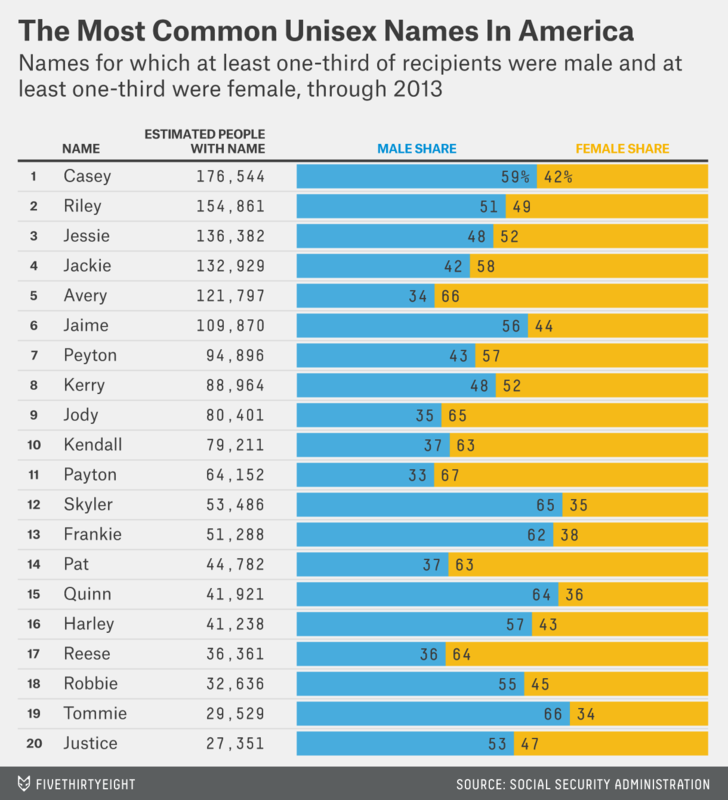 The Most Common Unisex Names In America: Is Yours One Of Them? Casey, Riley, Jessie and Jackie. Peyton, Jody, Kerry and Pat. Are these men or women? It can be hard to say because these names are pretty much unisex. Take Riley, for example. Nearly 155,000 living Americans are named Riley, and the male-to-female ratio is pretty balanced, with a 51 percent to 49 percent split. If Riley rings a bell, it may be because you saw a recent video of Riley Curry, the adorable 2-year-old daughter of NBA MVP Stephen Curry of the Golden State Warriors, at a post-game press conference. Or perhaps you’re thinking of Riley Cooper, the wide receiver for the Philadelphia Eagles. That’s the thing: Riley is neither a man’s name nor a woman’s. It’s both. It turns out that nearly 1 percent of Americans (or 1 in 109) have a unisex name, which means that at least one-third of newborns given that name were male and at least one-third were female. It’s hard to say what the “most” unisex name is, but the chart below lists the 20 most common unisex names, ranked by the total number of people with that name. For a name to make the top 20 cut, at least 25,000 people currently alive in America had to have it. Nearly 3 million people have one of the more than 900 names in the searchable table below. The “gap” column shows the difference in the male and female shares. The lower the number, the more evenly balanced the name is between the sexes (with a minimum value of zero and maximum of about 33.33). The SSA does not edit its list of names and as a result records a number of what are most likely placeholder names. We were able to identify five of these (Unknown, Unnamed, Infant, Infantof and Notnamed) and removed them from the data. Others, like Baby and Child, we thought were more ambiguous and so left them in. You can explore the code behind this analysis, as well as the full data set, at GitHub. CLARIFICATION (June 10, 2:27 p.m.): An earlier version of the searchable table of unisex names in this article excluded two likely placeholder names (Unknown and Unnamed) but should have excluded three more (Infant, Infantof and Notnamed). We’ve now taken those out of the data, too, and added an explanation.